Humphreys and the Hangman | AUTHOR. ACTOR. SWORDSMAN. ← Shakespeare’s Rebel – The Play! 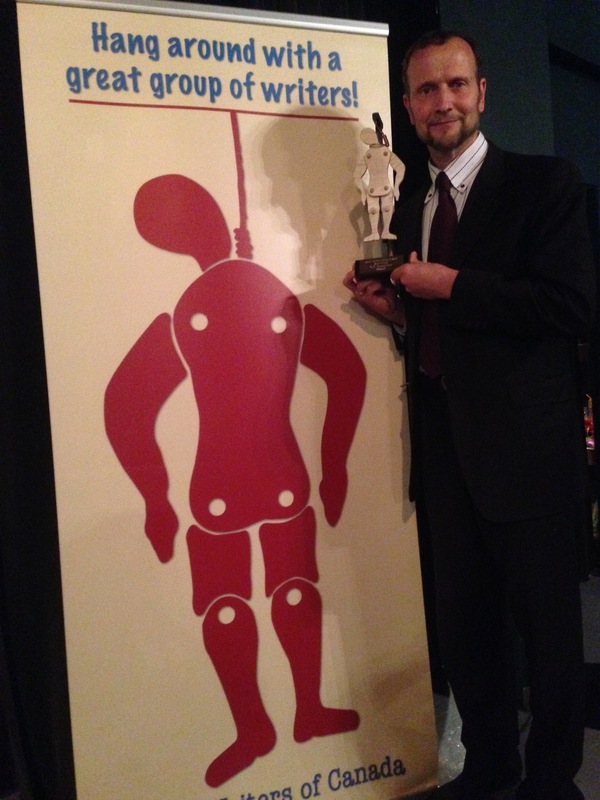 I have won the Arthur Ellis Award for Best Crime Novel in Canada 2015! Here I am at the gala last night in Toronto. Such a thrill! Amazing authors have won this award before and I am honoured to be in their company. The statue I am holding is of a man hanging on a gallows. You pull a string and his legs and arms move. Wonderfully macabre! Jeez, does that mean I am a crime writer now? This entry was posted in Uncategorized and tagged author, books, crime fiction, historical fiction, novels, publishing news, writers, Writing. Bookmark the permalink. Congratulations! Plague is really a great book! And the history of the Award’s name is really interesting! Thanks, Elena! I’m quite proud.